The Census Bureau also says that the median age for a first marriage is now the highest in modern history—29 for men and 27 for women. In contrast to the patterns of the past when adults in all socio-economic groups married at roughly the same rate, marriage today is more prevalent among those with higher incomes and more education. Over the years, societal attitudes have softened toward couples who live together and have children without being married. In the study Millennials in Adulthood, Pew Research also notes that “perhaps because of their delays in marrying, Millennials lead all generations in the share of out-of-wedlock births. Where can you find Millennials in the US? Newly-released US data from Esri Demographics can help you find them. 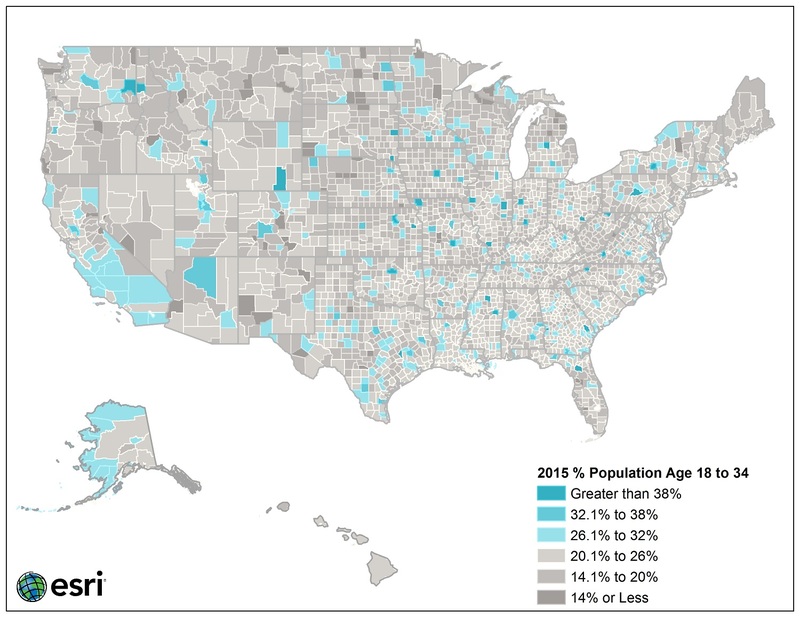 You can access the 2015 Updated Demographics data on ArcGIS Online through web maps, data enrichment, reports, and infographics and also through Esri Business Analyst products and apps such as Esri Community Analyst, Esri Maps for Office, ArcGIS Pro, and Explorer for ArcGIS. To map Millennials, check out Esri’s Smart Mapping capability, currently available in ArcGIS Online and ArcGIS for Server, so you can make maps in ArcGIS quickly and easily. Novice or expert, with smart mapping, you can easily create visually stunning maps that can show your stories about Millennials and all of your other interesting stories.